There are a range of tendinopathy presentations, from easily diagnosed with a local area of pain and clear pain response to tissue overload; through to patients with trickier presentations and multiple contributors to pain e.g. long term proximal hamstring or gluteal tendinopathy with a lumbar spine radiculopathy. Do tendinopathy patients always present with a small area of pain, or can they have pain in larger, more diffuse areas? How will you identify tendinopathy or other structures that may be contributing to your patients symptoms? How can you measure your patients load tolerance? What categories of tendinopathy patients can you use to help differentiate your treatment? 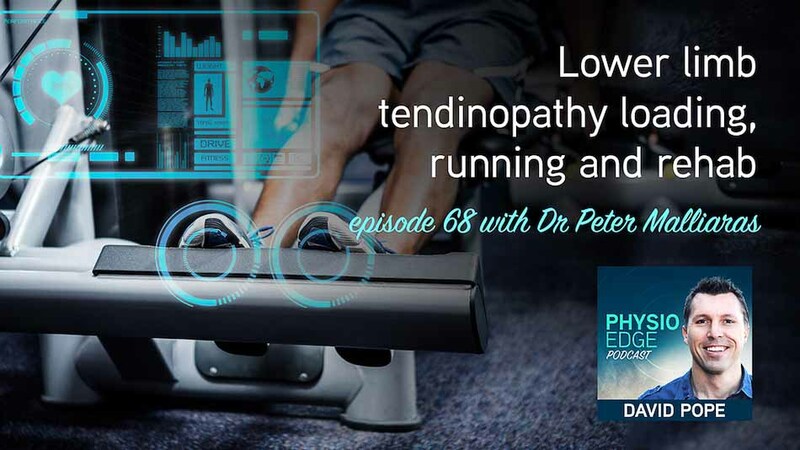 How can you rehabilitate patients with tendinopathy? What role does biomechanics have? What advice can you provide to your patients about load management, symptoms and flareups? When is it ok for your patients to continue or return to running? What strength tests should your patients be able to complete before returning to running? If your patients are not tolerating running, which aspects should you modify first - frequency, intensity, type or duration? When are isometrics useful in your treatment? When can you start isotonic and plyometric exercises? How can you incorporate tendon neuroplastic training (TNT)? Silbernagel et al. 2007a. Continued sports activity, using a pain-monitoring model, during rehabilitation in patients with Achilles tendinopathy: a randomized controlled trial. Silbernagel et al. 2007. Full symptomatic recovery does not ensure full recovery of muscle-tendon function in patients with Achilles tendinopathy.